Painted clay pots are really pretty in your kitchen to hold your utensils. The picture here shows you how you can decorate a clay pot to be very functional or just as a work of art. This flower pot has been painted for just decorative purposes. You could seal it and use it for potted plants but then you wouldnâ€™t see the inside painting. I like to make them for desk tops to hold pens and pencils or in your craft room to hold your scissors or rulers or many different items. You can also use them for potpourri. They look real nice for holidays and put different scented potpourri in them. You can paint them with many different colors depending on which holiday you want them for. They make great center pieces for the Fourth of July as well as Thanksgiving and Christmas. To paint this pot you need pastel colors. First, paint the pot inside and out with your soft colors. 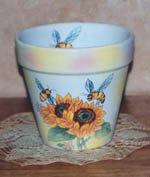 The base color on this pot is a light blue and then I used a sponge to put the different colored highlights on the rim. Either trace your pattern on the pot or freehand the design. A lot of the design I free hand but some of the design I trace on and then paint it. There are a lot of books with patterns that you can get. I use a lot of Folk Art books and paints. They have some beautiful designs that I like to work with. The neat thing about painted clay pots is that you can do so much with them. You can paint any kind of theme on them. They make beautiful Christmas pots for holding your decorations. Fill the pot with wrapped candy to set on your table. One thing you can do with them is to put a cloth inside the pot and put your warm buns in them to set on the table. If you do this it is best to seal the terra cotta pot with an acrylic sealer (available at craft stores). You can give them as gifts and people love them. Just use your imagination and you will be able to come up with all different kinds of things to use them for. They look great in bathrooms to hold artificial flowers to brighten up the room. These crafts can be done by anybody. You may have to practice a little bit but you will get very good at painting these clay pots. You can use any size pot. It just depends on what you are going to use the painted clay pots for. 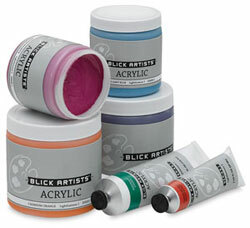 In the world of Arts and Crafts, clay pots offer so many ways to use your imagination. There are many ways to use them in your crafts.